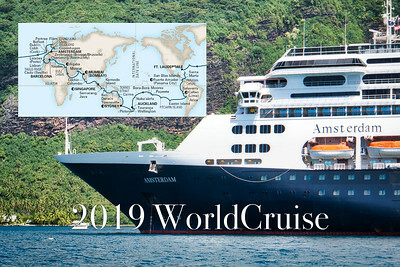 On January 22, 2019 we started on our voyage to 46 Ports in 27 Countries on 5 Continents in 113 Days on Holland America Lines ms Amsterdam. We will travel as far south as New Zealand and Australia, visit Indonesia, Singapore and India. Passing through the Suez Canal and the Mediterranean and going up the west coast of Europe as far north as Norway. Hope you Follow along as we venture on this journey.